Mommas got a brand new bag! Hi! My name is Jeannie Ortiz, I am happy to be a guest blogger…and I can’t stop making things! Right now I am all wrapped up with fiber arts – spinning, weaving, macrame and playing with all modes of adornment – sacred, beautiful, playful and practical. For the past five years, I have been living nomadically in the American West, India, Nepal and Mexico. I’ve spent countless hours meandering through the mountains or near the ocean where I find natural treasures to incorporate into my art. It is impossible for me to come back from a hike without pockets full of rocks and other treasures from the earth. 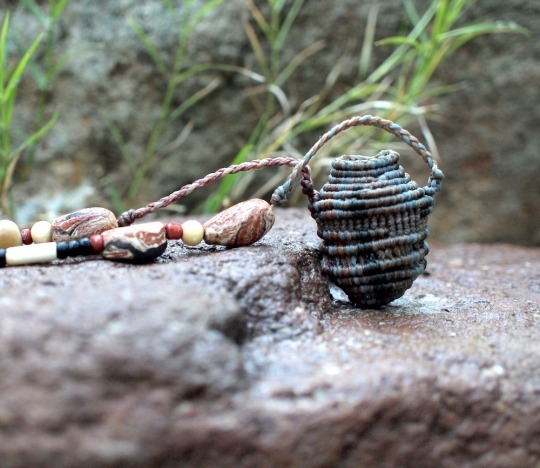 These crystals, stones, bones, seeds and wood meld together in an amazing puzzle with string or yarn to create something new, which carries an essence as ancient as the stones themselves. I create adornment that intersects every day life with the sacred and have always found it very important to draw from tribal cultures. In these cultures jewelry is worn not soley because it is beautiful, but because it connects them with their lands, people and history. In my work I want to create bonds from our primal humanity to our modern world by creating treasures that anyone can connect with. Macrame baskets feel like a natural form to carry the tiny treasure I find. The making of baskets is a personal way to incorporate all the cultural history of basket making – carrying food, belongings, ashes, sacred things – into a simple and beautiful object to be worn and treasured. Experimental macrame has become an amazing mode of working for me because of its sculptural possibilities and ability to marry many materials into one piece. At a certain point it is equally as important what is physically within the basket as the thoughts and ideas have been put into it by both creator and wearer. 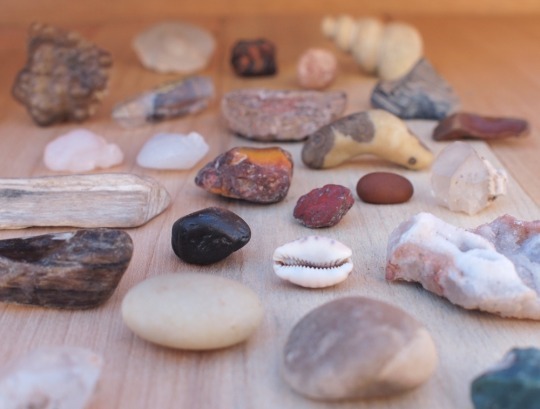 I like the idea that these stones I find move around in the world of people, bringing the energy of the place they were found to the wearer, whether it be from a mountain top in New Mexico, a stream in the Himalayas or the beach in Mexico. As they are worn and loved, I hope the pieces take on a new life with new stories becoming entwined within their knots. I love to make things that make you want to look closer, pieces that have a strong visual weight, although their physical weight may not be much. Wearing a piece of jewelry should be a sensual experience that engages more than just your eyes. Its like going to a museum and being able to touch the art, to feel it out, and see what it is all about. For many of the pieces, the stones are permanently knotted within, and are only visible upon close inspection, or when the sun hits just right to reveal the crystal, or turquoise nugget hidden inside. I also have a bit of an obsession with the need to make jewelry both extremely strong and comfortable, something that can be worn for weeks or years, and not be taken off. This comes from my own habit of breaking and loosing jewelry while swimming in a river, camping or dancing. It is important to find the balance between a visual delicacy and simplicity, and inner strength. Most of my necklaces are made of a supple waxed nylon which is extremely strong and lends itself very well to the tubular forms of macrame. When I physically begin a piece, it’s all about the central point. For the baskets I begin at the bottom of the basket and work up. For the pieces with a focal point, I begin with the stone, and watch it grow. The beads are also an amalgamation of collected treasures. In the formation of a necklace, the beads throughout become just as important as the center-piece. It all starts, and ends, from the need to create, to take the materials I have, or have found, and turn them into something new, something like I have never seen before. A constant evolution through experimentation is what it is all about…to truly make something new each time, with love.